the right mag carrier now, works with the A3 or the AR. FOR THE LOVE OF MIKE, ALREADY. STEYR, PUT A BOLT RELEASE ONT THE NATO STOCK. Took my NATO stocked AUG out today...along with my Kel-Tec PLR16...and my LWRC AR15. It was nice to use pmags in all of them...and only one of them an AR. Gotta love uniformity. I wish Steyr would make a left hand eject NATO stock, if MSAR can do it they have no excuse. Not enough volume orders to justify the mold changes would be my guess. I'm wondering how many NATO stocks they've sold. I haven't seen pics of militaries that issue the AUG using the NATO stock. They recently made 500 OD green Full auto NATO stocks. Send me your stock I will give you a left hand ejection port. Would you mind if I asked where you got it and how much? Is it possible to get a pic of the left side of the stock where the bolt release would normally be? Purchased it here on the EE. Apparently Steyr redid the Nato stock for their new A3 CL which has the ability for left hand ejection. However no bolt release. I appreciate the offer Kent, soon as I get a NATO stock I'll take you up on that. Maybe because I haven't had an AUG with a bolt release, the thought of it being a problem hasn't occurred to me. I'm right handed and don't mind using the charging handle. Going to the Manticore Switchback might have made this more appealing to me...hated that OEM handle. I have 3 AR's and none of them are ambi, so I have to move my left hand anyway to tap the bolt release from last round bolt-hold-open. While that's easier than manipulating the charging handle, I haven't really been put off by the lack of a similar AR release. People are different, however, and I certainly wouldn't shun a bolt release button. Now when I have the bolt held open by the charging handle hold-open function, it's no harder and maybe even easier to just tap the Switchback to get into battery. Who has NATO stocks for sale? 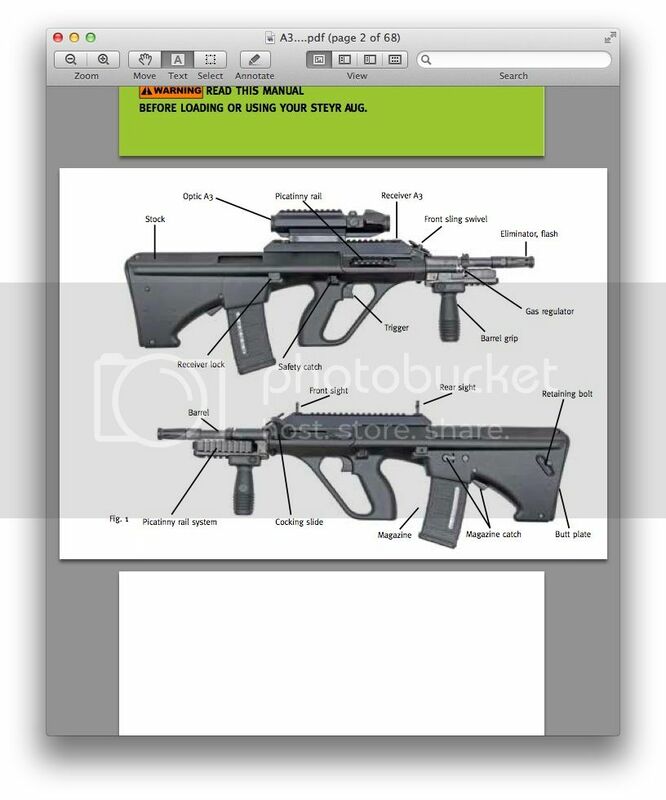 Looking at the above pic ^^, does the AUG A3 have back up sights built into the rail? The pic makes it appear that way. Looks like it.. It would be awesome. My A3 has the long rail, no sights. I would post a pic, but my camera is not working. My msar came with both stg and nato stocks so I'll need to dig it out and see if it fits. The USA made/imported A3 does not have backup sights on/in the rail. The above pic is not a standard US A3 AUG.